I love seeing my blocks come together in collage form each month. Makes me feel accomplished, if only slightly. 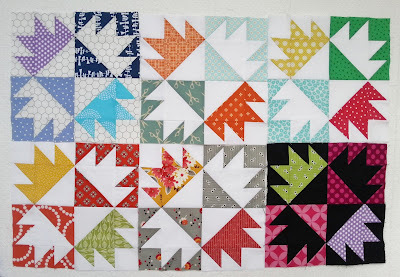 These are the Chicken Foot blocks I made for everyone in August for the Sew Pieceful Block Swap. The ladies asked for blues and purples, brights, citrus colors, and neons. I hope I interpreted their mosaics correctly. The two I made for myself are both in the middle ~ Aqua and Orange on the top and Flea Market Fancy on the bottom. For now I'm slightly bummed as I missed signing up for the September swap. I had a new color scheme and mosaic all ready to go, too. I guess I'll have to save it for October. That is such a fun block. I love the colors you used. Bummer that you missed out on the swap for September. Hello Emily,love your Blog Header,especially the quilt on the far left.Is that a quilt of yours? I'd love to know the name of the block and pattern? So neat!